Jade has long been a favorite material for jewelry in China, and it has also long been a symbol of "virtue". The Chinese word for jade, (yu in pinyin) appears in many popular sayings, such as ning wei yu sui, bu wei wa quan which roughly translates as having the determination to sacrifice yourself to do the right thing, rather than live without dignity, and jin yu liang yan which refers to helpful advice offered by a respectable person. In 2008, the Olympic Games in Beijing honored the gold, silver and bronze winners with medals that featured a technique known as jinxiangyu, which means to inlay, or onlay jade with gold or silver. In the case of the Olympic medals they were respectively made with jade-inlaid gold, jade-inlaid silver, and jade-inlaid bronze. 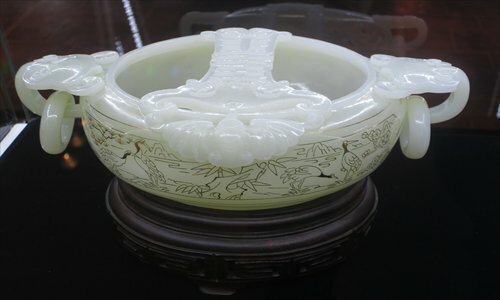 This brought China's "time-honored" jade culture under the spotlight of the world. And recently, the Jinxiangyu Museum opened its doors in Yuyuan Garden in Shanghai. Set up by Fujian-based Huachang Jewelry - which was recognized by the China Gold Association earlier this year as a "first choice brand" for jinxiangyu items - the museum showcases more than 100 jinxiangyu designs from the firm featuring varying kinds of craftsmanship. An imperial jade seal was once a sign of supreme power in China. Legend has it that back in the Western Han Dynasty (206BC-25AD) an official called Wang Mang overthrew the government of the Han Dynasty. However, he was only able to recover a broken imperial jade seal from the former empress dowager. So Wang sought out craftsmen to rebuild the lost parts of the seal with gold, and then he named it a jinxiangyu seal, giving an official name to the exquisite technique of combining jade with gold for the first time. During Emperor Qianlong's reign in the Qing Dynasty (1644-1911), the technique of jinxiangyu was so favored by this emperor that he decreed only the royal family could wear these jewelry items. Among the museum's collection, visitors can find reproductions of eight pieces of imperial jinxiangyu items, including a pair of gold-embedded jade bracelets from the Tang Dynasty (618-907), a lotus-shaped hairpin from the Ming Dynasty (1368-1644), and a gold wine cup embedded with a dozen of gemstones, pearls and jade from the Qing Dynasty. 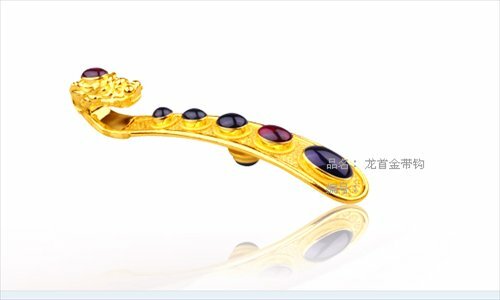 "The most complicated technique of making jinxiangyu items is called jinyincuo, and requires craftsmen firstly to engrave the jade with patterns and then to fill in this carving with liquid gold or silver," said Liu Ying, a senior jewelry consultant at the Huachang Jewelry company. 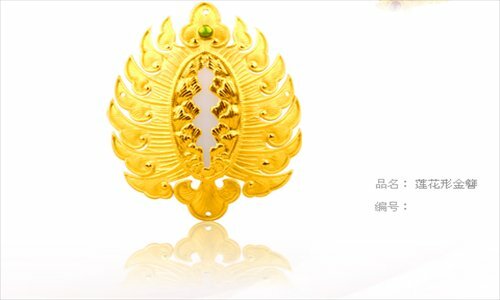 "The craftsmen must be very skillful so that they can finish the gold or silver line in a delicate and consistent way," Liu told the Global Times. Commonly-seen patterns include traditional Chinese "good fortune" images such like cloud, dragon, phoenix, and lotus.